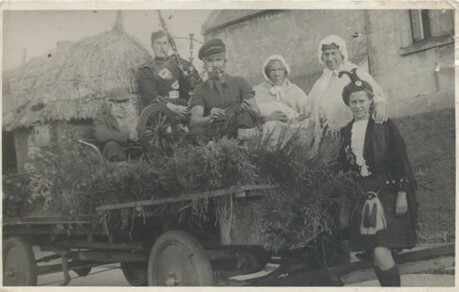 Left to Right: Kenny Urquhart (Piper), Sandy MacKinnon, Alex Urquhart, Colina MacLaren and Agnes Borley. Colina was the one who ran the Temperance Hotel and was in the Town Council. I should think that this photo was taken in the mid 1930s, which was when Agnes was dancing. Yes Jet, it was in the mid 1930s.